Lunch on the Brittany Ferries "Pont-Aven"
You will be transported to France without leaving Ringaskiddy Port as our extremely popular annual luncheon aboard the Brittany Ferries flagship vessel the “Pont-Aven” will be once again held in association with the France Ireland Chamber of Commerce. 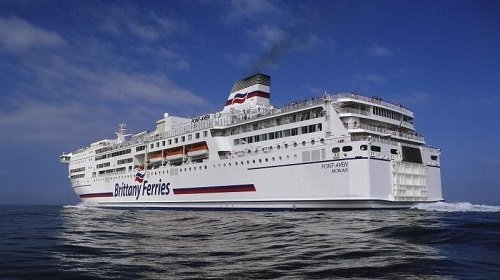 The Pont-Aven is a luxury ferry with the feel of a cruise ship that travels weekly between Cork and Roscoff - the shortest, fastest ferry crossing from Ireland to France. This event provides you with an exclusive opportunity to see the fantastic facilities available on board while enjoying a charming afternoon in wonderful company. Your three hour French escape will begin with an “Apéritif” drinks reception in the ship’s Bar Le Grand Pavois followed by a sumptuous luncheon prepared by the best of French chefs and served with specially selected French wines. Book your tickets now to sample the authentic French on-board experience of Pont-Aven for yourself - tu le mérites!